Saved a bunch of money. Sounds like brand new. The products and customer service is beyond outstanding. I called in for a repair kit and was told I could upgrade to a rubber surround vs the original foam. What a difference!!!!! Bass tones are more tight and even more bass than original once cranked up on my JL 8W3's. Thanks guys!! Install was also a breeze, just watch their video and follow along. Thanks guys! The rubber surrounds are great! I restored my woofers to better than original! Thanks Simply Speakers. Excellent product and very helpful video. My Jamo 502's are now good as new. I have used your company on several speakers i have done in the past. Excellent service and products. Bought the surrounds to replace the surrounds on a pair of Onkyo #W2098AN woofers. This is a home made set of speakers I built around 1991. While the replacement surrounds were not an exact fit, they installed seamlessly and the speakers work and sound just as good, so I'm very pleased. Here's the funny thing: I bought the woofers in a "Buyout" special for 13.95 each. I paid more for the replacement surrounds than the speakers themselves! No complaints though, I'm happy to have the working again! Perfect repair for stock subwoofer driver in 2001 Suburban (non Bose). Q: Will this rubber edge outlast the foam? Will this kit fit my EPI 8" woofer. 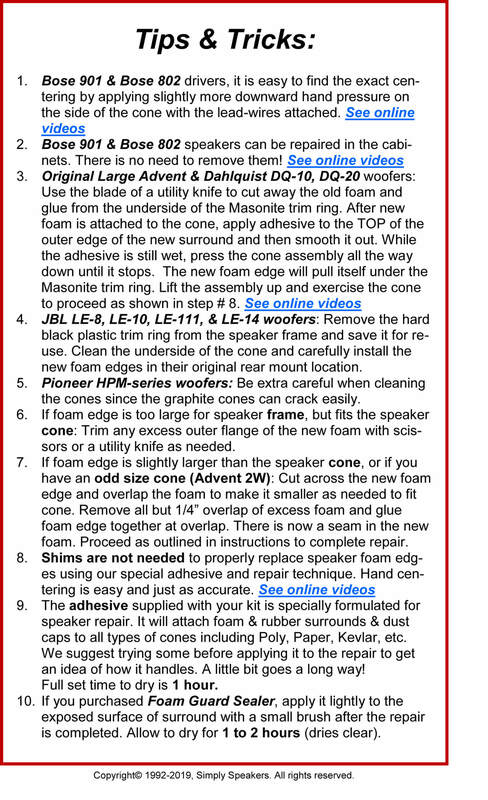 A: Yes, this material will outlast foam and also fits 8" EPI woofers. 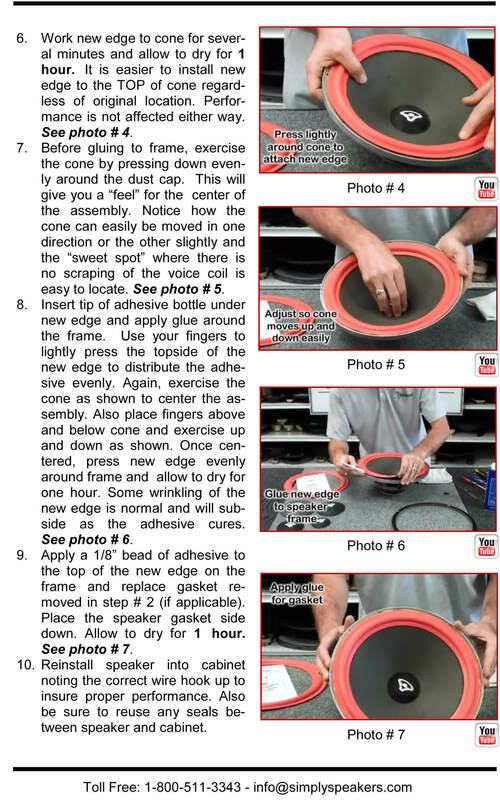 Q: Will this fit the genesis 1 angle 8" cone? 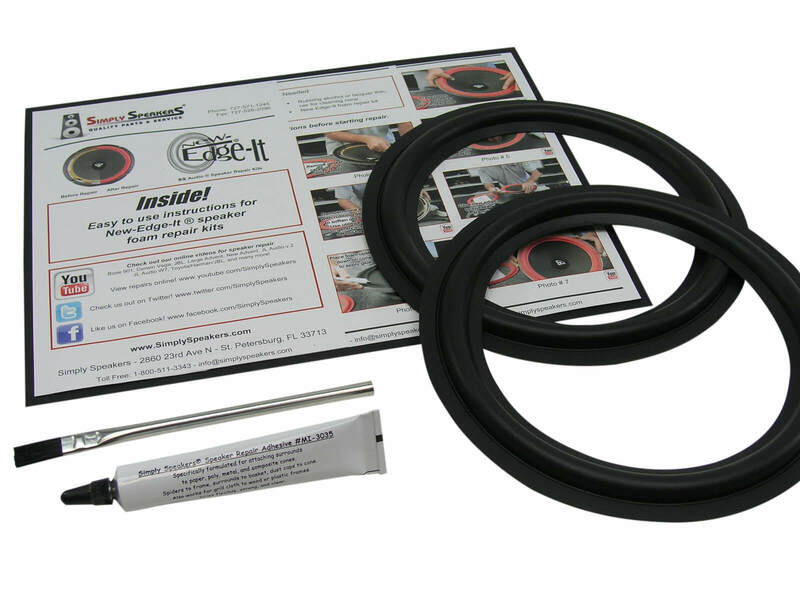 A: Yes, this kit will fit the Genesis 1 model 8" woofers. Q: Will these fit 8" Epicure woofers with mounting holes 8.5" on center? 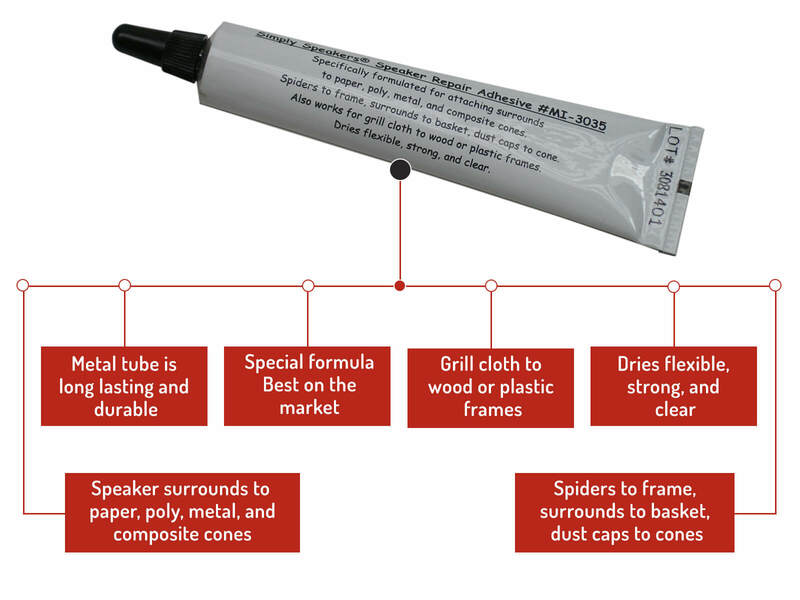 A: This kit will fit any Epicure with an 8.25" frame and a 6" cone. Q: Hi my KEF 104aB's B200 driver unit (1975), the side skirts flatten out unevenly. The B200 uses rubber side skirts. Can this fit? I done the measurements of the cone and total diameter and its very close. Thanks. A: Yes, this kit will fit your model. Thanks! 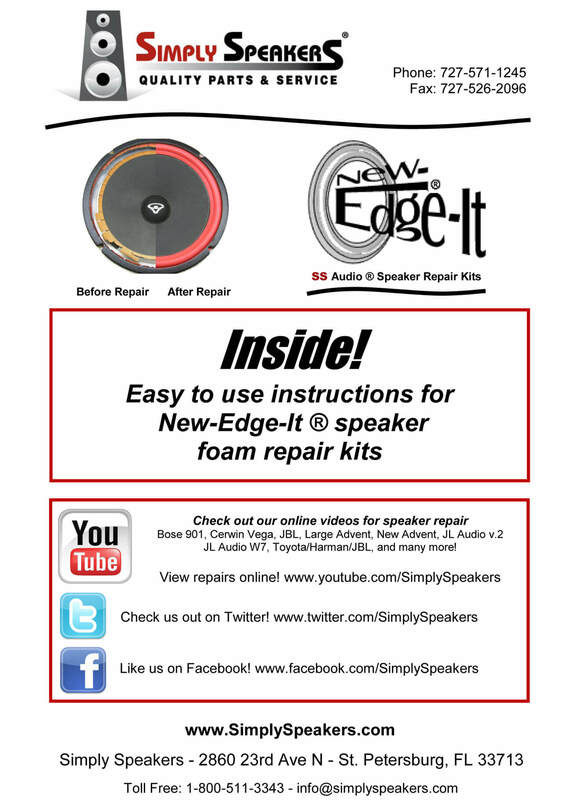 Q: Will this kit work on B&O Beovox S45.2 Peerless woofers? A: Yes, this kit will fit and work the same way as our original foam kits for any of the Peerless made woofers with 6" diameter cones, including B&O. Q: Will this item fit the woofer on the Vandersteen 1B Speakers? The surrounds I have now are a rubber material and not the foam of the later 1B's or 1C's. A: Yes, this kit will fit the rubber surround versions of all Vandersteen 8" woofers. Q: Will this kit fit Castle Howard II 8 inch woofers? A: Yes, this kit will fit all Castle 8" drivers. 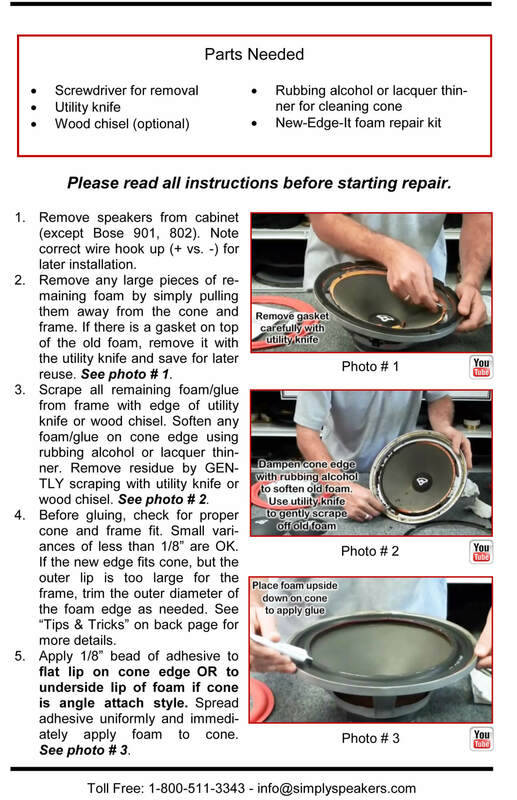 Q: Will this repair kit work for M&K 8" MKMX70-BXR1? I know the original was foam, but I was hoping the rubber edge would work just as well and last much longer. 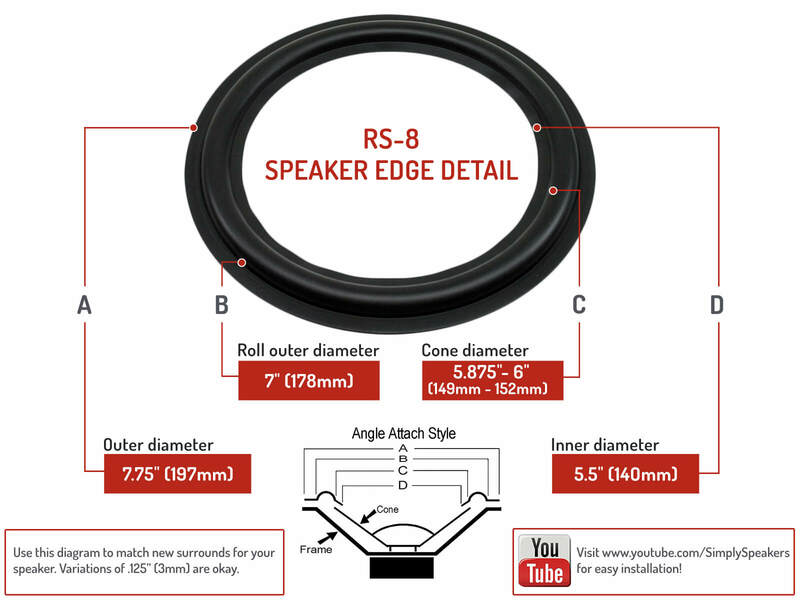 A: Yes, you can use the RSK-8 rubber surround kit as opposed to the foam kit for the M&K subwoofer. Q: Can you recommend this product for Bose 601 Series I woofers? A: This kit will fit your model, but we normally use the original foam edge version kit part # BSE-FSK-8. Thanks!